Tools to Help Format Your Paper, Memo or Brief! With the semester now underway, we would like to bring to your attention some of the recent developments at the Law Library. While I encourage you to read this newsletter in its entirety, I would like to highlight a few specific things. The first concerns study aids that the Law Library has to offer, including two popular electronic resources for exam preparation: West Academic Study Aids and LexisNexis Digital Library. Many students find these and other study aids to be invaluable tools for outlining and reviewing course content. I also strongly encourage you to check out the latest Daniel R. Coquillette Rare Book Room exhibit: “Robert Morris: Lawyer & Activist.” Morris was one of the first African-American lawyers in the U.S. and played a large part in anti-slavery circles and the civil-rights issues of his day. The exhibit was curated by Mary Bilder and Laurel Davis and was made possible by the generosity of the Burns Library and the Boston Athenaeum. For a preview of its many remarkable artifacts (including Morris’s business card and his personal copy of The Federalist), please visit the exhibit webpage. And remember, every Wednesday from 12:30-1:00 p.m. the Law Library holds a meditation session that is open to the entire law-school community. The sessions are easygoing and are meant for the neophyte and the veteran alike. In the high-stakes world of law, everyone could benefit from a few minutes of quiet reflection and focused breathing. As always, if you have any questions, please feel free to contact the Law Library or ATR. I wish you a joyful and productive spring semester. Are you an anxious person? Are you prone to catastrophic thoughts (what experts call “catastrophizing”)? Do you often rethink the worst-case scenario over and over again? Do you think that you could benefit from a few minutes of scheduled relaxation and self-reflection? Are you, in other words, a law student? Then you might consider joining us on Wednesdays from 12:30-1:00 p.m. (during the common lunch hour) in the Law Library’s Contemplation Room (Room 427) for a weekly meditation session. These sessions are appropriate for the beginner and the seasoned meditator alike. Meditation is a technique for training the mind that builds focus and awareness of the present moment. More specifically, it is the intentional practice of uncritically focusing one’s attention on one thing at a time. Regular meditation is known to ease stress levels, improve cognition, and encourage compassion, among other things. Sessions start with reflection on a poem or breathing exercises and end with a guided meditation or 15 minutes of silent meditation. The Contemplation Room is open during normal Law Library hours for individual meditation and silent prayer sessions. There are floor pillows and comfortable chairs in the room. Please maintain a respectful silence in the Contemplation Room. It is a cell phone free zone. Law Library Tools to Help Format Your Paper, Memo or Brief! Want to spend more time polishing your research paper, memo or brief and less time worrying about citation format? The Law Library has just what you need: a guide to citation software tools. You can download Lexis for Microsoft Office and have your citations corrected as you draft your document. Perhaps you would rather use Drafting Assistant from Westlaw, which allows you to upload your Word document, set your desired citation form, and then check your citations and accept suggested edits. If you are a confirmed Lexis user, BriefCheck from Lexis provides the same functionality, namely the ability to upload a Word document and run a citation check and correct any cite format issues. Among the other tools highlighted in the guide is CARA from Casetext, a tool which not only checks your citations but suggests related cases you may not have cited in your document. 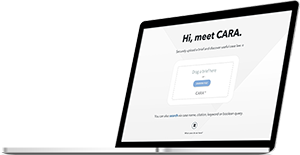 You can register for a free trial for CARA here. If you would like to schedule an appointment with a legal reference librarian for help with these tools, e-mail lawref@bc.edu. LexisNexis Digital Library - Allows Boston College Law students to access helpful LexisNexis Publishing study aids, including the popular Understanding Series, Skills and Values Series, as well as the Questions & Answers Series. The Understanding Series offers an in-depth review of the law in areas such as securities, bankruptcy, evidence and more. Borrowing is via the OverDrive platform. Read content in a web browser or download to an e-reader app. West Academic Study Aids - Provides Boston College Law students with unlimited access to more than 430 titles from West Academic Publishing, Foundation Press, and the Gilberts series. Other study series include Acing Series, Black Letter Series, Career Guides, Concise Hornbooks, Law Stories, Nutshells, Sum & Substance and Short & Happy Guides. Want to try listening to a Sum and Substance audio review? This is part of the study aids package offered by BC Law Library. Get started now by creating a free West Academic account. Curated by Professor Mary Bilder and Curator of Rare Books Laurel Davis, the exhibit is entitled “Robert Morris: Lawyer & Activist”. 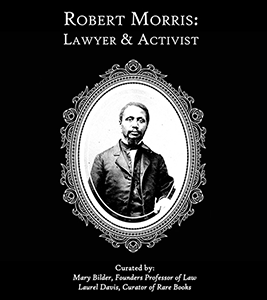 Morris (1823-1882), long known as one of the first African-American lawyers in the country, was a mover and shaker in Boston anti-slavery circles but also a full-throated civil rights activist in many other areas. He also had a fascinating relationship with Boston's Irish community and a very young Boston College. The Burns Library on main campus has Morris’s personal library in its collection; the staff at the Burns generously loaned us all of the books in our exhibit. Additionally, the Boston Athenaeum kindly loaned multiple items from their Robert Morris papers. Through his books and papers, the curators were able to explore Morris's many dimensions. As always, students are welcome and encouraged to use the Rare Book Room as a quiet study space, whenever the room is open, generally weekdays from 9 a.m. – 5 p.m. Students are equally welcome to use our special collections for research projects or to simply ask to see an item for mere curiosity’s sake! At the beginning of 2017, Lexis finally completed the transfer of international materials from the Lexis.com platform to Lexis Advance. For years, researchers continued to rely on Lexis.com—the old, “classic” research platform—for most of the international legal research even after the introduction of Lexis Advance. Fortunately, the transition has finally been completed. Lexis.com has ceased its existence and most of the foreign or international legal research can now be conducted on Lexis Advance. However, due to the regrouping of international materials, researchers may experience some slight confusion if they are unfamiliar with this area of Lexis Advance. The international materials moved from Lexis.com are re-grouped in different categories on the new platform. 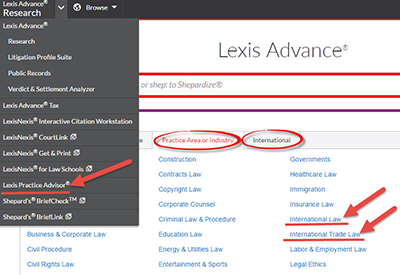 As of today, researchers can access international materials on Lexis Advance from at least three places: the International Tab, “International Law” or “International Trade Law” on the Practice Area or Industry Tab, or the Lexis Practice Advisor on the dropdown menu of Lexis Advance Research. The International Tab is most useful for researchers interested in the primary law of a particular foreign jurisdiction. Contents on that tab are grouped by jurisdiction. Depending on the particular jurisdiction, cases, legislation or regulations may be included in the collection. It’s worth mentioning that Lexis grouped the European Court of Human Rights (ECHR) cases with the cases of European Union, even though ECHR is not directly related to the European Union. For researchers interested in transactional law, the Lexis Practice Advisor is a great place to explore international content involved in transnational deals or transactions. For most of the practice areas, Lexis includes an international section that offers articles or practice notes with very current and practical content. For example, researchers may explore the “International Insolvency” section in the Bankruptcy area, or the “International Considerations” section in the Corporate and M&A area. 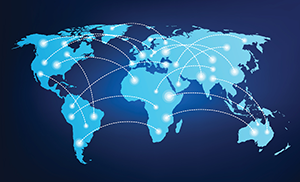 To serve a growing interest in international trade law, the Law Library has compiled a rich collection of electronic resources to aid your legal research. Below is a list of selected databases specializing in international trade law. All of the databases are accessible from the Law Library Database List. If you need help researching in any of those databases, please feel free to contact the legal information librarians. BNA: “International” or “Trade and Commerce” Library: These two libraries on BNA provide access to International Trade Daily, International Trade Reporter, WTO Reporter and other related content. Users may set up email alerts on the individual publications to keep current with the law. TradeLawGuide: TradeLawGuide is the standard for methodical and efficient research in the area of WTO law. Features include "noting up," the examination of judicial treatment of legislation and cases, a crucial step in legal research. WorldTradeLaw.net: A legal research tool for WTO dispute settlement. Features include an up-to-date keyword index and a database of dispute settlement tables and statistics. World Trade Online (Alternative Name(s) & Keywords: Inside U.S. Trade): Provides access to current and archived issues of Inside U.S. Trade newsletter as well as a database library comprising over 100,000 trade-related documents including policy papers, WTO decisions, draft and final regulations, court decisions, legislation and more. This database is currently on trial. The Law Library’s Spring into Practice Research Fair on Wednesday, February 22, brought students and research products/vendors together. These particular vendors were selected to introduce law students to practice-oriented resources they will encounter in summer positions and in new careers. Students munched on lunch provided by vendors while picking up swag, entering drawings, and picking up great tips for success this summer and beyond. The Lexis prize wheel offered points, candy or swag to law students who learned about Lexis Practice Advisor, tips for summer success, and a reminder that Shepard’s is the industry standard for case verification. 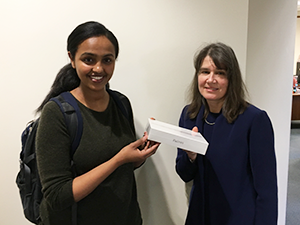 Thomson Reuters, the parent company of Westlaw, handed out water bottles, lunch boxes and raffled off an i-pad mini, which was won by 2L Saba Habte. MCLE provided tips on using the MCLE Online Pass, a continuing legal education platform with audio, video and text content, in addition to copies of the Handbook of Legal Research in Massachusetts, containing content authored by 2 BC Law librarians. Intelligize, our new platform for seamless access to SEC filings and related documentation, will be raffling off an i-Watch to our students who participate in their online training. Both Intellionnect and Practicing Law Institute introduced students to new search interfaces for their research databases. Be on the lookout for the switch from the IntelliConnect platform to Cheetah very soon. Social Law Library provides a free year of membership to any BC Law alumni, a great deal for access to electronic legal information as well as a super paper collection. LexisNexis e-Books introduced a new, easy to use format for using treatises and study aids published by Lexis. This is also the exclusive platform for access to the official Massachusetts Supreme Judicial Court and Appeals Court Advance Sheets.